If you're in business you've experienced the tension that exists between finance and marketing. Whether it's between a CFO & CMO or even between the two functions in an SMB owners own mind, there's always tension...and sometimes even conflict. It's almost inevitable - traditionally one counts pennies and the other throws dollars to the wind hoping that something works. That's counterproductive to revenue growth AND corporate harmony. And it's unnecessary. The foundation of the conflict has always been the lack of accountability of marketing. And although marketers have taken full advantage of the big mystery, it was a fact of most B2B marketing for many years. And now you're told that you need to invest more in social media, content marketing, digital marketing, inbound marketing....every marketing gimmick it seems. And still nobody can tell you how you'll measure real business return. It's frustrating! That's changed now - and with it the role of the CMO and CFO are both changing when it comes to resource allocation for marketing and biz dev. This eBook draws on extensive B2B sales & marketing experience, P&L perspective and research from PWC strategy&, Warc, HubSpot & McKinsey. It's time to change the mindset of marketing as an expense vs. a cost of sales; and to create strategic value! 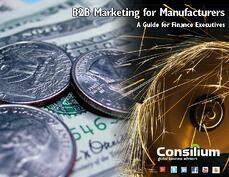 This free 15 page eBook was written by a former industrial manufacturing executive. Ed Marsh has walked in your shoes - he's had to make those resource allocation decisions; to decide whether to invest in marketing without measurable return. Today he consults with industrial manufacturing companies to develop revenue growth strategies and tactically execute them. This eBook tackles the thorny issue of marketing budgets and performance in a straightforward empirical way - just like you should expect. It's intended for owners, presidents, GMs and CFOs of a wide range of industrial manufacturers including OEMs, capital equipment, process control and automation manufacturers, MRO suppliers, industrial distributors and more. The approach, and the eBook, simply make sense. Download it today to learn how you can turn the debate over marketing spending on its head - and make investment decisions for marketing like every other business investment.